You want dominance? Over the last decade, the Patriots are 123-37 with no record worse than 10-6. They are 10-for-10 in division titles, just won their third Super Bowl in that stretch, and have played in the last eight consecutive AFC Championship Games … and that’s just the second half of their current dynasty run. But you knew all that already. More interesting than where the Patriots have been of late is where they might be going, and … we have no idea. We have wondered when the New England run will end for a decade now. I can distinctly remember watching Highly Questionable in 2014 after the Patriots suffered that beatdown at the hands of the Chiefs and seeing Dan Le Batard say Kyle Orton was the best quarterback in the AFC East. The Patriots won the Super Bowl that year. You don’t have to like the Patriots. (I don’t.) But you have to appreciate the run. Let’s take a look at the best Patriots fantasy seasons of the last decade. It probably won’t come as a big surprise that Brady owns all 10 of the top Patriots top-10 QB seasons over the last 10 years — Jimmy Garoppolo’s 36-point 2016 is the best QB total from anyone but him in that time. Brady’s 2011 stands head and shoulders above the rest, though, when he set a career-high in passing yards and a decade-high in passing touchdowns. Even his rushing yards were the second-highest total of his career. The narrative of the Patriots’ backfield is a confounding one. Yes, “Bill Belichick hates your fantasy team.” We know the story. 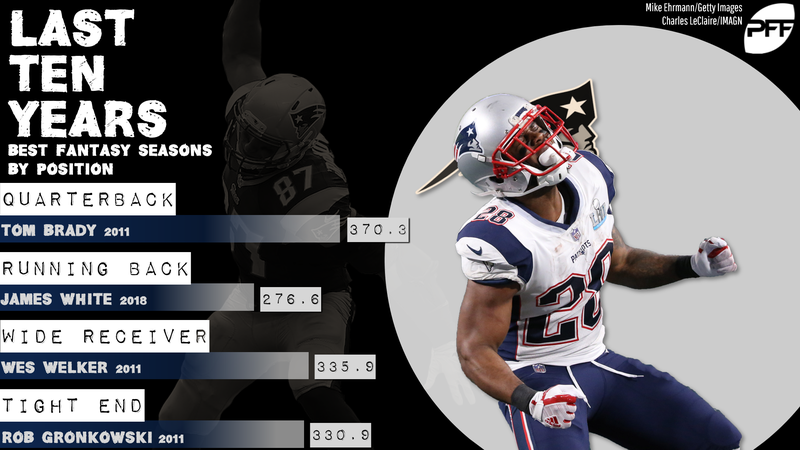 At the same time, three of the Patriots’ top four backfield seasons in the last decade have come in the last three years — albeit from three different guys, with White, LeGarrette Blount, and Dion Lewis all topping 200 PPR points in the last three seasons. White benefited from injuries to Sony Michel and Rex Burkhead in 2018 and had his most efficient season, so counting on a repeat from him with those backs likely healthy in 2019 might be a bad plan, but his 2018 will always be an impressive performance. Welker has three of the top four Patriots receiver seasons in the last decade. Julian Edelman has the next three after that. Between the two of them, they have nine of the team’s top 13 receiver seasons. I’m just saying all that in case you weren’t sure if the team has a type at the position. Welker’s 2011, though, has nearly a 50-point advantage over any other receiver season the team has had in our timeframe. He was a monster for a while there. Gronkowski being a dominant performer over the last decade isn’t news. The fact that even the best tight end of all time could have a best season that was almost 70 full points clear of his second-best season is, though. That 2011 season featured a career-high in yards by almost 200, a career-high in touchdowns by 5, a career-high in receptions by 8, and his only career rushing touchdown. Gronk is the best. Gronk 2011 is the best of the best.